The Open Ephys headstages use Intan amplifier chips to filter, amplify, and multiplex 32 or 64 channels of neural data. 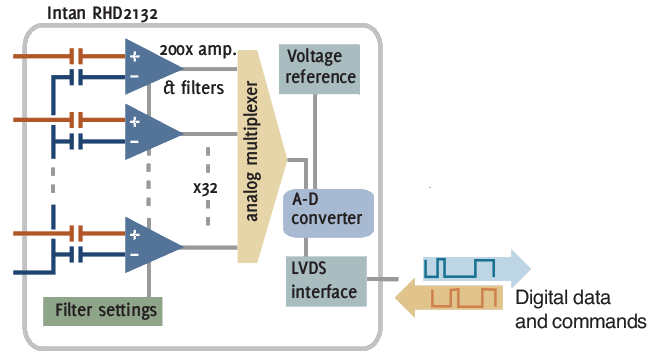 An analog-to-digital converter inside the chip digitizes each signal with 16-bit resolution. Instead of one wire per channel, as is required for analog headstages, our headstage can send up to 128 channels over a thin tether with only 12 wires. And the signal is purely digital, so there are no tether artifacts. The Open Ephys system is 100% compatible with commercially available Intan headstages. Block diagram of an Intan amplifier&A/D chip. The Intan RHD family of amplifier & A/D chips integrates all basic functions of an extracellular recording system on a single chip. Neural data is transmitted to the acquisition board with a digital LVDS interface for robust signal transmission over long, thin tethers. Examples of headstages compatible with our system. 16, 32, and 64-channel variants can be purchased through the Intan website. New headstages can easily be derived from freely available design files. The Open Ephys and Intan Headstages all share the same standardized connector and pin assignment (wiki). This means that cables are easy and cheap to replace, and you can choose from a wide array of headstage designs to fit your needs. It's easy to make and share new designs. The LVDS standard that is used by the interface means that cables can be very long (>5m), and very thin (only 12 wires, down to 38AWG (wiki)), enabling freely moving mice or birds without counterweights. The standard also specifies up to 2 Intan chips per 12-pin cable, so you can record up to 128 channels on one thin tether. Adding another 128 channels only requires 4 more wires.